Brining is a process similar to marination in which meat is soaked in a liquid before cooking to make the meat moister. Marinades typically uses acidic ingredients such as vinegar or lemon juice or liquids containing enzymes like pineapple juice to partially breakdown the meat. Brines use a process called osmosis to introduce moisture into the meat. 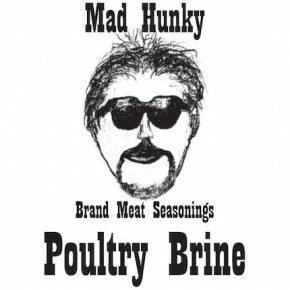 The Mad Hunky store sells brine for poultry and pork. 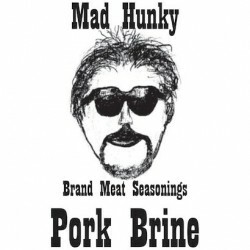 The Mad Hunky brand brine contains phosphate and is free from gluten, peanuts and MSG. Our brine will make your meat moist and adds a nice flavor. Feel free to take a look at this video that demonstrates the efficient use of our brine. Although the video is using poultry brining, the process for pork brining is similar. 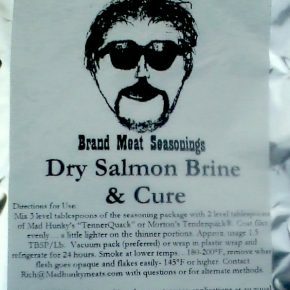 Mildly sweet/savory curing brine for Salmon and other fish that smoke up well. Hints of onion and black pepper among other flavors and the sweet component is dry honey. 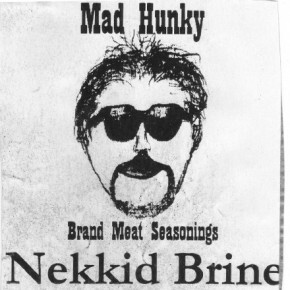 Made to be used with Mad Hunky’s “TennerQuack” or Morton’s Tenderquick® cure. 8 ounce package produces about 1 pound of complete mix. Approximate usage 1.5 Tbsp/Lb.